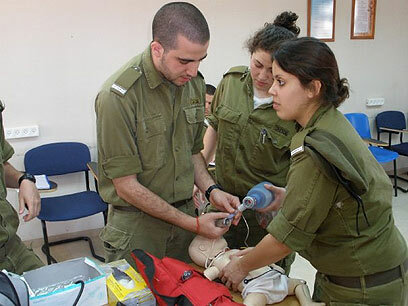 An IDF force was alerted Monday to treat a Palestinian woman who went into labor at a checkpoint in the Jordan Valley. The soldiers worked with Palestinians at the checkpoint to move the woman to a military ambulance where she gave birth. The infant, who had difficulty breathing, was resuscitated and then evacuated to a Jerusalem hospital by helicopter. "There is a great deal of satisfaction in giving life," Sergeant Gilad Nesher, a paramedic who treated the woman and child, told Ynet.